Popularity breeds congestion. The hill behind the Idyllwild Elementary School was the community’s most-used sledding area in January 1974. The caption read, “Where, oh, where is the County Parks’ long-promised improvement, including sledding slope?” Inner tubes, saucers, toboggans and plastic sleds got an enthusiastic workout the prior weekend. Although a short section of the road next to the school was posted agains parking, it was not enforced at the time of this photograph. The Chamber of Commerce announced that a deputy sheriff would be assigned to the area, and a new switchboard would be installed in the summer to handle 200 phones. A University of Southern California movie crew photographed the Chamber meeting for a film dealing with the proposed Idyllwild Arts Foundation. The Forest Service reported the snow pack in the high country was the deepest since 1941. It was estimated that 6 feet covered Tahquitz Valley while above Fern Valley the depth was about 3 feet. The San Jacinto Mountain communities passed through another fire season without forest or structure fires despite drought conditions and high winds. The biggest storm in five years blanketed the mountains, stranding motorists but bringing joy to sledders. Three people were marooned at Decker Ranch at theupper end of Fuller Mill Creek where there was 3 feet of snow. An 18-man rescue team brought them out by toboggan. One woman in an isolated cabin in Pine Cove, when reached by friends, was out of provisions and had to resort to nibbling the squirrels’ nuts. The County Planning Commission’s hearing board recommended approval of the Lions Club’s plans for a trap-shooting range. Two storms left 4 inches of moisture and 18 inches of snow. The heavy moisture content of the snow snapped power lines around town. 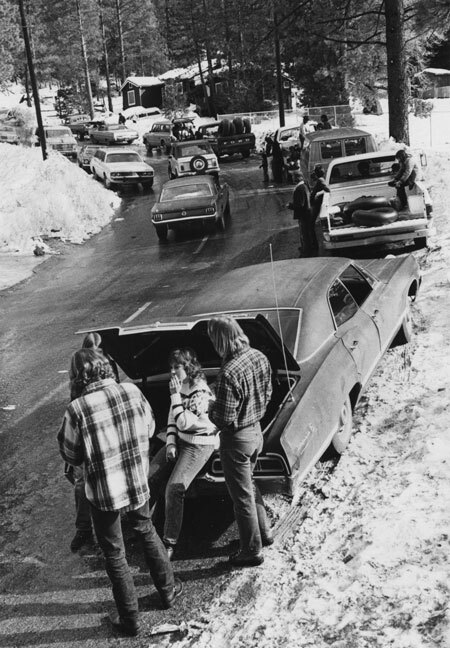 Although snowplows worked day and night, road travel was difficult. Joy Adamson, author of “Born Free,” visited Idyllwild and addressed Desert Sun students. Tor and Liv Benestad of Oslo, Norway, were new managers of Silver Pines Lodge. “Here it’s like spring in Norway,” Tor declared. Word was received of the death of Carl Lykken, a summer resident. Lykken was the first postmaster in Palm Springs. In the late 1920s, he delivered mail to Idyllwild by driving up the old Banning Road. The price of coffee was soaring. Ken Richey of Village Market said his cost leaped $13 per case between shipments. A year-end summary from the county Building and Safety Department showed that the value of building permits issued for local construction in 1976 more than doubled the previous year’s figure. Six local real estate firms banded together to form Idyllwild’s first multiple-listing service. Other firms joined later. Hill activity was returning to normal following a storm the week before that dumped 25 inches of snow on Idyllwild. One death was attributed to the weather. Lafe Ralstin of Pine Cove suffered an apparent heart attack while shoveling snow. The storm, the biggest in three years, made it impossible for local gas companies to deliver liquid petroleum gas to many homes on unplowed streets. Liability insurance for the Pine Cove County Water District was threatened to be canceled if the district continued to allow the Idyllwild Softball Association to use water district property. The American Red Cross was trying to breathe life into its mountain-area Disaster Assistance Team and was asking for volunteers to step forward by mid-March. A Mission Viejo man, Michael Noretti, was rescued from the wilderness area of Round Valley after being lost for 36 hours. Riverside Mountain Rescue Unit and rescue units from Montrose, Sierra Madre and San Bernardino, as well as two sheriff’s helicopters, aided in the search. Lorenz Vilim Karlic was convicted by a jury on eight charges facing him in a Pasadena court, but was still a long way from being tried as a suspect in the murder of Fern Valley resident Ben Ackley. It had been more than a week since daylight temperatures were greater than 50 degrees. Worse, every night during this period, temperatures had often dropped significantly below freezing. The result was frozen water all over the Hill, despite the dry winter. The annual spelling bee at Idyllwild School saw fierce competition. The winners, Shelby Read, Maggie McKinson, Adrian Hernandez and Nick Anderson, were to represent Idyllwild in the Hemet School District Spelling Bee.